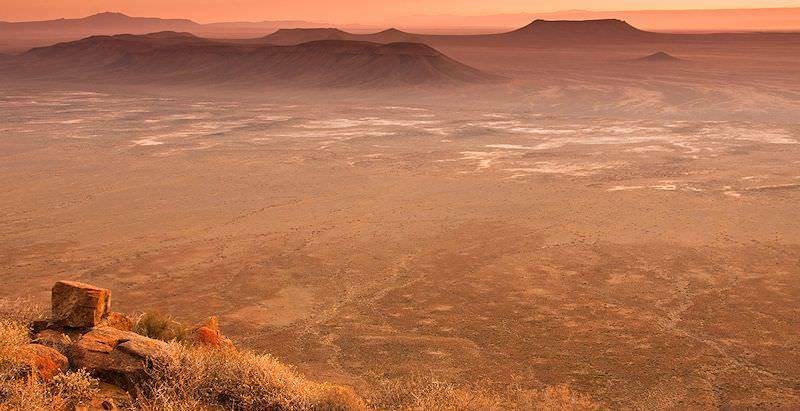 The Karoo National Park is a breathtakingly stark, deafeningly quiet corner of South Africa. The Karoo National Park was established on the outskirts of Beaufort West to conserve a representative sample of the region's unique heritage. It has been enlarged over the years and now encompasses vast, flat plains as well as the rugged Nuweveld Mountains. Animals such as mountain reedbuck, grey rhebok, kudu, steenbok, jackal and aardwolf occur naturally, while reintroduced species include springbok, hartebeest, gemsbok (oryx), black wildebeest, Cape mountain zebra and the endangered black rhino and riverine rabbit. Some 196 bird species have been recorded, and the park also sustains more than 20 black eagle pairs. Lions were reintroduced into the park in 2010 - the first lions in the Karoo in 170 years. Other predators include leopard, caracal, black-backed jackal, Cape fox, bat-eared fox and several mongoose species. The Karoo National Park offers some comfortable accommodation establishments. The Karoo Rest Camp is found in the foothills of the Nuweveld Mountains. Thatched chalets blend in with the exquisite natural surroundings, and are fully equipped, serviced and air-conditioned. There is also a sparkling swimming pool and a caravan park nearby. For people who want to sample true mountain air freshness, the rustic Mountain View Rest Camp offers guests sweeping views of the lovely countryside but, as the rondavels are not fully equipped, guests will need to bring their own bedding and towels. The Fossil Trail is a must for all visitors to the Karoo National Park. It is even accessible to wheelchair users, and makes for a great group outing. It is only 400m long, but it encompasses the geology and palaeontology of the Great Karoo perfectly. It is an educational experience and can be done at your preferred pace, as information is shared via huge placards. There are two picnic sites in the park which are perfect for taking some time out. Here you can simply enjoy the scenery, whilst enjoying a meal or having a ‘braai’ (barbecue). The Bulkraal picnic area has a large swimming pool which can be enjoyed by visitors and is a great way to cool down after a long day in the Karoo heat. The park offers various 4x4 eco-trails as well as self-drive opportunities. 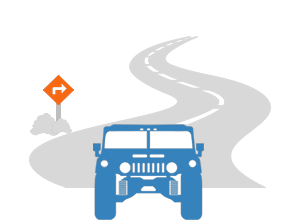 Whenever the need for adventure arises, you can hop into the car and explore the roads. The routes vary in terms of difficulty degrees covering rocky ridges and sandy sections. Your African Sky guide will make sure that you explore all the best roads. The Karoo National Park is located just outside the town of Beaufort West. 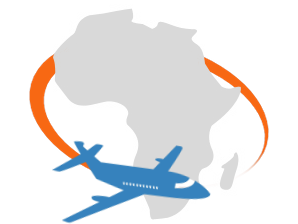 Guests traveling to the park will fly either to George International Airport in the Garden Route which is located less 300km from Beaufort West, or be chartered on a light aircraft to Beaufort West airstrip - all depending on your safari itinerary. The road from George to Beaufort West is one of the most beautiful South Africa. Guests will be transported via a private, air-conditioned vehicle from George over the Outeniqua Mountains. It is the corridor that connects the Little and Great Karoo with the western coastal regions and offers spectacular views of both. The Karoo has a semi-arid climate and extreme temperatures do occur in the peak of summer and winter. It is therefore best to visit in either spring or autumn when the temperatures are milder. In terms of wildlife viewing, however, the Karoo National Park can be visited all year round. During the dry winter season from May to September, daytime temperatures are more comfortable than in summer. The winter evenings can, however, become quite cold, and morning game drives are chilly. In December and January, when summer is in full swing, it gets very hot, sometimes uncomfortably so, and daytime activities may be limited. Spring (September to mid-November) is a great time to visit, not only because of the milder temperatures, but also because the flowers bloom during this time. The Karoo National Park was officially proclaimed in 1979 and, in 1989, the first rest camp was opened. It might have happened much later, if it wasn’t for the tireless efforts of a local farmer, William Quinton. Quinton was a born conservationist and enthusiastic birder. During the late 1950’s, Quinton began campaigning for a conservation area close to Beaufort West, which led to the Town Council of Beaufort West donating 7 209 hectares of communal land to form the nucleus of the Karoo National Park. The South African Nature Foundation then purchased more land to be incorporated and created the Karoo National Park as we know it today. The Karoo National Park takes you back hundreds of millions of years in history. The geological layer exposed to the surface in the park 0 known as 'the Beaufort Group' - was deposited between 240 and 280 million years ago. It reveals what life in the area was like before Gondwana broke up 180 million years ago. Gondwana was a super-continent consisting of what is today known as Africa, South America, Antarctica, India and Australia. There is a fossil trail in Karoo National Park that guides you through the palaeontology in the area. On this trail, you will find ancient reptiles, extinct amphibians and mammal-like reptiles. Palaeontologists have painted a comprehensive picture of this prehistoric environment that can be easily understood. The vast arid landscape of the Karoo National Park is host to an amazing array of animals. Dainty klipspringers can be seen all along the rocky outcrops. Herds of springbok, gemsbok, buffalo, Cape mountain zebra, red hartebeest and eland fill the plains. If you are lucky enough, you might come across a browsing kudu. The cunning black-backed jackal thrives in this reserve, and bat-eared foxes come out at night when they mostly eat the local harvester termites. More than 20 breeding pairs of Verreaux's eagles nest in the reserve, and can be seen gliding effortlessly as they scan the ground for unlucky rodents. They'll even pick off dassies(rock hyrax) from rocky outcrops. Lions have been successfully reintroduced into the area, and became rather famous when a young male named Sylvester escaped the park in 2015, and again in 2016. The highly endangered riverine rabbit has also been successfully resettled in the reserve. The reserve also contains rau quagga. The rau quagga resembles the extinct quagga that died out in the 1800’s. The quagga was a sub-specie of Burchell's zebra that looked just like the zebra, except that its back half was brown. The rau quagga is just an artificially selected Burchell's zebra that has been bred to look like the quagga. The park has the most species of tortoise worldwide - five in total. The endangered black rhinoceros also occurs. The Karoo is the largest ecosystem in South Africa. It comprises two bio-geographical regions, namely the Namaqualand-Namib and the Southern Karoo domain. Several vegetation types as well as unique geological features can be found in the Karoo, which is the world’s only plant hotspot that is completely arid. The area is also particularly well-known for its high levels of plant endemism, with more than 1 900 species that cannot be found anywhere else on earth. Despite its many unique trademarks, only 3% lies within areas that have a focus on conservation. The Karoo National Park conserves an area of approximately 760 km2. The landscape is dry, harsh and challenging. Nevertheless, a wide variety of fauna and even wider variety of flora have adapted to survive these trying conditions. Deciduous dwarf shrubs and grasslands are the dominant vegetation types, and include the Montane Karoo grassy shrublands, Karoo grassy dwarf shrublands and Karoo succulent dwarf shrublands, to name a few. In terms of geological features, the park is situated in the Ecca Group of the Karoo Supergroup, which consists mainly of mudstone and sandstone that give the rocky outcrops and formations a striking red and gold tinge. The Karoo is a vast land, and one of the best ways to explore its various attractions is by means of the four 4x4 eco-trails, such as the longer Nuweveld Eco Trail, that spans 90 km, and the short Afsaal Eco Trail, that is only 13km in extent. The Klipspringer Pass is a favorite amongst visitors, whereas the Pienaars Pass should be avoided unless you are interested in very serious off-roading. Taking a walk through the 400m wheelchair-friendly Fossil Trail offers great insight into the ecology, physical structure and palaeontology of the Great Karoo, and actual fossils and fossilized trees can be seen. Drives and walks in the park are conducted by experienced guides. Game drives are usually very successful - because of the sparse vegetation, animals can be seen from miles away. The park also has two picnic spots. The Bulkraal picnic site is comfortably situated next to the swimming pool, where visitors can relax and enjoy the view of the landscape. This is also a great place to view the sunset and enjoy a sundowner. The Doornhoek site is within the game area, and is ideal for a light brunch or lunch and a well-deserved break after a morning drive. It is, however, not fenced, so it’s best to stay within the designated area. Birding is also a popular activity, and birders can make their way to the specially constructed bird hide at the rest camp. Beyond its breathtaking solitude and silence, you'll actually find a wealth to savor in the seeming 'nothingness' of the Karoo. Take a closer look at the unique geology and learn about the region's prehistoric history. The Karoo National Park is a perfect place to experience the marvels of the Karoo’s rocky splendor that covers this vast expanse. The park is situated in the Ecca Group of the Karoo Supergroup, which was deposited from 280 to 240 million years ago. The Karoo is the world’s only plant hotspot that is completely arid, and is renowned for its high levels of plant endemism. Enjoy a guided walk with an expert guide that will leave you amazed at the various ecosystems that the parched region sustains. If you want to get away from the Karoo heat, the bird hide situated close to the rest camp at the little dam is the perfect place to take some time. More than 200 species of birds can be found in the park, which means you will always have a great view. There is a very decent restaurant at the main rest camp, as well as a shop for basic necessities and picnic sites. The main town is not far from the park, where more restaurants and shops are available. The closest town, Beaufort West, is about 10 minutes drive away. Can you go for the day? Day visitors are welcome, and there are no bookings required. What is a good family activity to partake in? The Fossil Trail is a family-friendly activity, as it is only 400m long, and there are genuine fossils and petrified wood on display. The trail is also wheelchair-friendly. Are there entrance fees for the park? There is an entrance fee for day visitors per person per day. If you book into the park accommodation, it is included. All fees will be included in your package price. Is there any reception in the park? In some areas of the park you may find cellphone reception, but it remains quite limited. What type of animals can be viewed in the park? There are various herds of plains game (including springbok, buffalo, eland and kudu), as well as black rhinos, foxes, jackals, ostriches and since recently, lions. There is also great variety for bird watchers. Travel to South Africa for an in-depth look at the 'world in one country'. Botswana is Southern Africa's top safari destination, boasting a wealth of wilderness areas. Namibia's most prolific safari area is Etosha National Park in the north. Zambia's off-the-beaten-track safari areas include Kafue and Lower Zambezi National Park. Travel to Zimbabwe for a mesmerizing look at the Victoria Falls. Mozambique is an expansive coastal country with 1000km of beach. The Kruger National Park stretches across almost two million hectares of lowveld wilderness in northeastern South Africa. The Sabi Sand Private Game Reserve boasts some of South Africa's most esteemed lodges, including the Singita collection and Londolozi. The city of Cape Town's top tour attractions range from iconic Table Mountain to historically significant Robben Island. The Garden Route is an alluring travel destination, offering a wealth of attractions like primordial forests and sparkling lakes.